We’ve all experienced the irritation of having a mosquito in the room at night. The high-pitched buzzing at it flies past your ear. The itchy welts that appear on the body after it has feasted on your blood. But mosquitoes are more than just a source of irritation. They are vectors for pathogens that cause diseases such as malaria (Plasmodium parasites) and dengue fever (dengue viruses). Although malaria can cause fatality, it is only a risk in forested border regions of Thailand, and is largely preventable and curable. Dengue fever, however, is widespread—including in urban areas—high risk in rainy season, and has no specific treatment or vaccine. 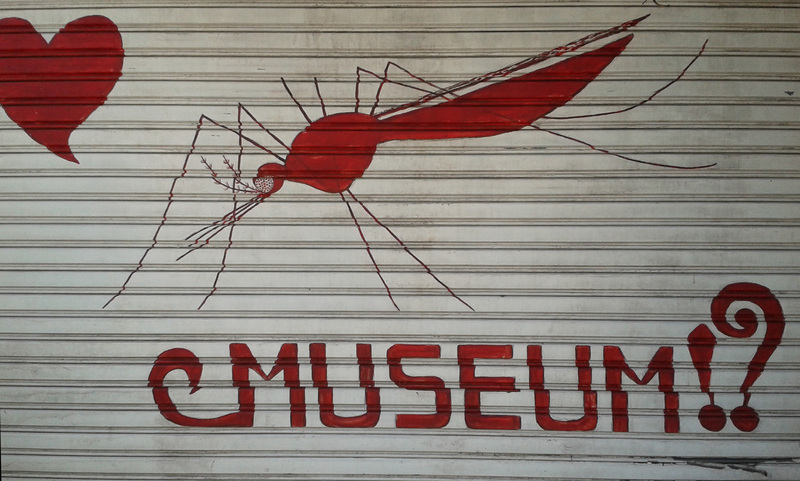 However, mosquitoes are not all bad, as I learned from a visit to the Museum of World Insects and Natural Wonders in Nimmanhemin Road, Chiang Mai. This private museum houses a vast collection of insects (including an entire room dedicated to the mosquito), fossils, shells, wood carvings and other items, amassed by husband and wife Mr. Manop and Dr. Rampa Rattanarithikul and described as a “labour of love”. 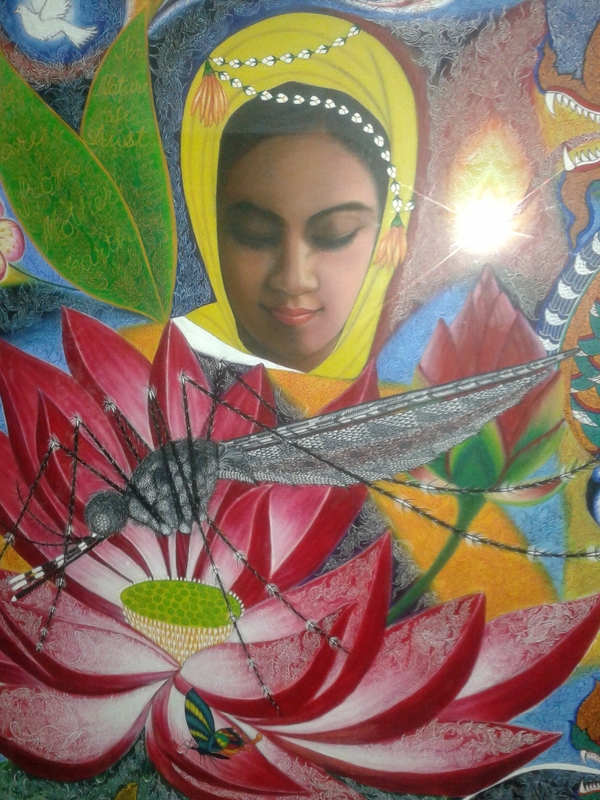 One of a series of paintings by Manop Rattanarithikul, produced in honour of his wife Rampa, “The Mosquito’s Friend”. The Rattanarithikuls both have extensive mosquito research histories. Manop Rattanarithikul first worked on a malaria control project in 1950, later becoming a malaria investigator for the United States Operation Mission to Thailand (USOM) and a mosquito taxonomist for the US Armed Forces Research Institute of Medical Sciences (AFRIMS). After retraining in law, he remained passionate about insects, continuing to contribute specimens for the museum, and later producing mosquito-inspired artwork. Dr. Rampa Rattanarithikul began working as a technician on a USOM malaria control program in 1959—her first collaboration with her husband. Over a research career spanning more than 5 decades, she contributed to multiple projects for the AFRIMS, gained a PhD in Entomology from Kobe University School of Medicine in Japan, authored 44 academic papers and the Illustrated Keys to the Mosquitoes in Thailand, and even had two mosquito species named after her (Anopheles rampae and Uranotaenia rampae). 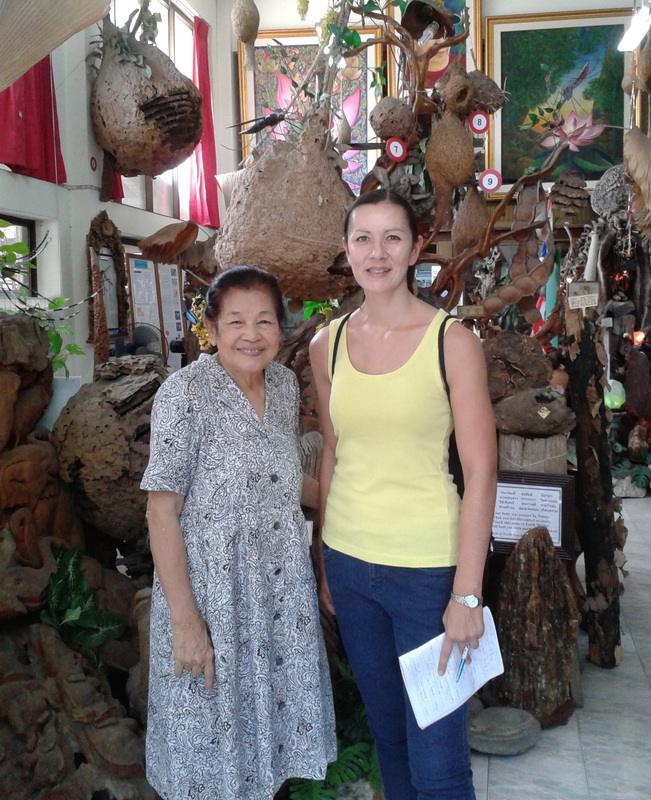 With Dr. Rampa Rattanarithikul at the Museum of World Insects and Natural Wonders, Chiang Mai. In 2011, she received the Belkin award—the highest honour given by the American Mosquito Control Association—for her contributions to medical entomology, mosquito studies and public health.I was delighted to meet Dr. Rampa in person when I visited the Museum of World Insects and Natural Wonders, and she warmly explained the museum layout and showed me the mosquito room, answering my questions and enquiring about my own interests. Dr. Rampa explained that the museum opened in 2000, although collections have been ongoing since 1957. The museum’s sister branch, on Rajadamnern Road, is a more recent development, having opened only 2 years ago. A spritely 75, Dr. Rampa continued to assist on overseas projects, including collections for the British Museum and museums in the United States, until as recently as 2011. She has since stopped travelling—“mai wai laew!” she laughed (can’t handle it)—but maintains a daily presence at the museum, welcoming guests and introducing the displays. Dr. Rampa informed me that 460 species of mosquito have currently been identified in Thailand, of which only 9 are vectors for 4 diseases that are dangerous to humans: malaria, dengue fever, Japanese encephalitis and filiarisis (which can cause elephantitis). It is, in fact, only the female mosquito that carries disease—female mosquitoes ingest the blood of humans and animals to obtain energy for egg development, whereas male mosquitoes feed off flower juice and tree sap. But how does the mosquito benefit humans? Posters at the museum explain that mosquitoes provide sources of food for birds and fish, are pollinators of flowering plants, and help to “clean” the environment. They can also be used as biological control agents (the larvae of the Toxorhynchites splendens are predators and can be used to control dengue-transmitting mosquito species) and tools in disease research (assay systems and disease models). I asked Dr. Rampa for her thoughts on recent reports of success in dengue vaccine trials, and whether she believed an effective dengue vaccine would soon be available. But she explained that the major dengue fever preventive measure is removing containers of stagnant water (e.g., tanks, buckets, vases, artificial ponds and poor drainage systems), on the surface of which female mosquitoes lay their eggs. 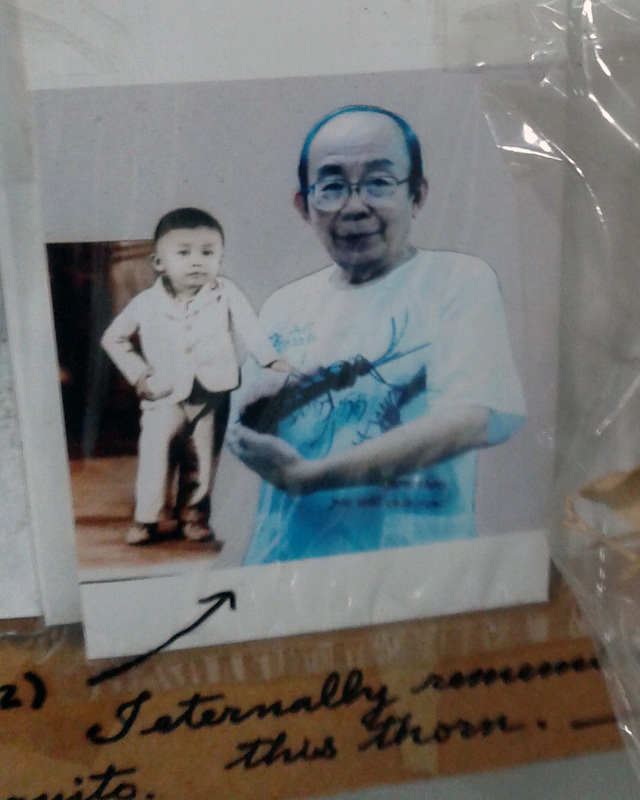 Mr. Manop Rattanarithikul, pictured in adulthood and as a boy aged 3. Had she ever contracted malaria or dengue fever? “Yes, of course,” (nodding). “In this line of work you have to accept,” she conceded. Although her husband wasn’t there to meet in person, his account of his first experience of malaria (displayed at the Rajadamnern Road branch) is a story I won’t forget easily. Manop Rattanarithikul first contracted malaria in 1942 (aged 9), after his family had taken refuge in a rural Chiang Mai village during World War 2. Seventy percent of the village’s inhabitants were infected and, within 3 months, the boy had become another patient. His symptoms were so severe it was expected he would die. Desperate for their son’s health to improve, his parents took him to a magic woman in the village, who subjected the boy to an unusual bloodletting ritual. Young Manop underwent the “treatment” an additional 10 times over the subsequent 2 months. Two months later, his body started to show signs of recovery. A year later he was cured, likely because the parasite had already completed its life cycle within his body; though Manop appreciates he is lucky to have survived. 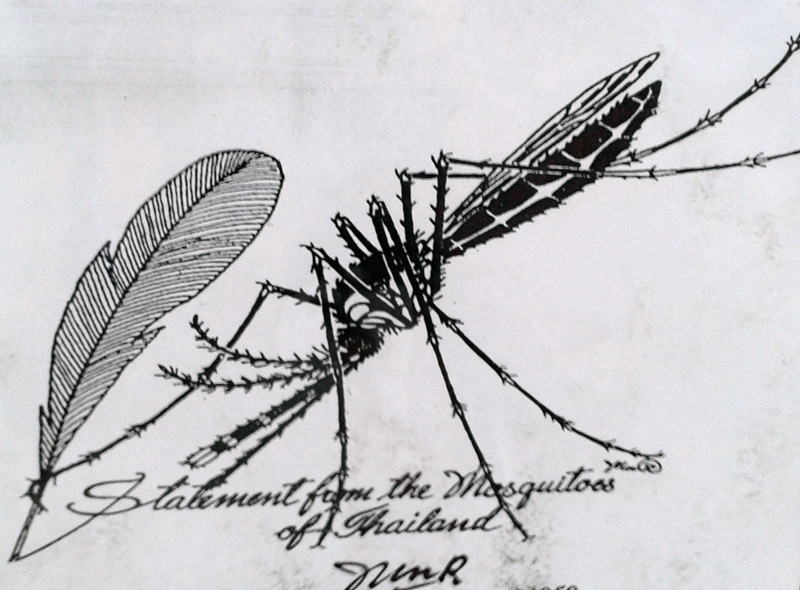 Despite both having contracted malaria on several occasions, the Rattanarithikuls believe that the mosquito is no enemy to humans—even a disease-carrying variety. Like the Dalai Lama, they believe in karma and equality in the value of life (“the human and the tiny mosquito have the same beneficial value and natural purpose“). Posters around the museum convey their beliefs in the balance of nature and the ecosystem, and stress that all insects were collected at their ends of their lifespans—under rocks, trees and vegetation, or in areas disturbed by human activity. Later that evening, back at my hotel, I spotted a mosquito that had found its way into my room. It hovered sleepily by my bathroom mirror and I speculated that it must be a female, lazy after sucking the blood of another hotel resident. I hesitated momentarily as I considered the insect’s fate, thinking of Dr. Rattanarithikul and her philosophy on the value of all creatures’ lives. Then I thought of dengue fever, my skin’s allergic reaction to mosquito bites, and images of a patient with elephantitis on display in the museum. The mosquito’s life came to an abrupt end as I pledged to read some Dalai Lama quotes sometime. This article appears in Faces of Thailand in Chiang Mai City News (2 October, 2014).